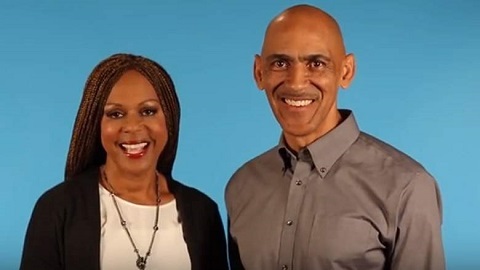 Tony Dungy is a retired professional football player as well as a coach in NFL. Besides his playing career, he served as a head coach for Tampa Bay Buccaneers from 1996 to 2001. Moreover, he also worked as a head coach of the Indianapolis Colts from 2002 to 2008. He is the first black head coach to win Super Bowl. On February 6, 2016, Tony Dungy was elected to the Pro Football Hall of Fame. He is estimated to have the net worth of $10 million. Tony Dungy was born as Anthony Kevin Dungy on October 6, 1955, in Jackson, Michigan, the United States. He was born to Wilbur Dungy and Cleomae Dungy. He is the only son of his parents. His father served as a pilot during World War II as well as a professor at Jackson College. Tony attended the local school during his childhood. He passed his early life in his own birthplace with his parents. He completed his graduation from the University of Minnesota. Regarding the net worth of Tony Dungy, he has an estimated net worth of $10 million in 2018, including all of his properties and earnings ($5 million lesser compared to fellow NFL coach, Bill Cowher). He used to receive an annual salary of $2 million. He owns a beautiful house in Tampa and also has luxurious cars. He earned his net worth as a head coach in the National Football League. He was the head coach from 1996 to 2001 for the Tampa Bay Buccaneers and for the Indianapolis Colts from 2002 to 2008. Currently, he is an analyst on NBC's Football Night in America. Tony started playing football since his childhood with his friends. He played on the school teams. He continued his playing career at his university. Well, after playing quarterback in college, in 1977 he was undrafted. After that Pittsburgh Steelers of National Football League signed him as free for his safety. During his career at Steelers, he played as a defensive reserve and special teams player. As well as he also played Super Bowl champion 1978 season. Tony played as an emergency quarterback for the team in the place of Terry Bradshaw and Mike Kruczek in 1977 game against the Houston Oilers. He won the Super Bowl title as a player after his team won the Super Bowl XIII. Later he joined San Francisco 49ers in 1979. And after year he retired from his professional career as a player after playing for New York Giants in 1980. After his retirement, he started working as a coach. In 1980 he worked at the University of Minnesota as a coach. But after a year he was asked to join NFL as a head coach. Well, in 1981, he was hired as an assistant coach for Steelers by head coach Chuck Noll. In 1982 he served as a defensive coordinator for Minnesota Vikings under Dennis Green. Tony's dream of being the head coach of NFL was fulfilled after Rich McKay hired him to reform the Tampa Bay Buccaneers. During his coaching career at Tampa, his team won many tournaments. He served there until 2001. After that, he joined Indianapolis Colts on January 22, 2002. His club was able to win many seasons. Later in 2009, he left the club and Jim Caldwell was chosen as the head coach of the club. Talking about his personal life, Tony Dungy is blessed with happily married as well as family life. He married his beloved wife Lauren Harris in 1982. The couple has seven children named James Dungy, Eric Dungy, Jordan Dungy, Jason Dungy, Justin Dungy, Jade Dungy, and Tiara D.
Besides this, there are no records of his their relationships. These couples are maintaining a good relationship so it is impossible to have their divorce. As well we can't even imagine it. Professional football player Tony is 62 years old. His nationality is American and the ethnicity is white. His height is 1.83 m and weighs 85 kg. He began a mentoring program for young people called Mentors for Life and provided Buccaneers' tickets for the participants. He also supported other charitable programs in the area such as Big Brothers/Big Sisters, Boys and Girls Club, the Prison Crusade Ministry, foster parenting organizations, and Family First. He is a good friend of Jon Gruden and Bill Parcells.